If you’re a regular viewer of cooking shows and the antics of celebrity chefs, you have probably seen the trendy cooking method known as sous vide. Sous vide is a method of cooking food by immersing it into a temperature-controlled environment like a water bath or cooker. This cooking method is becoming more well known for home cooks who are keen to deliver more evenly cooked, consistently good food, to the exact level of done-ness every time. 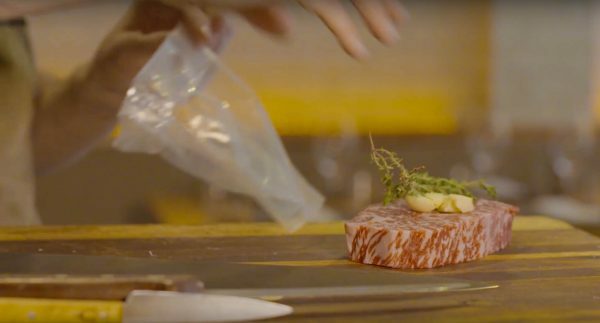 While it seems like a bit of a trend at the moment, the concept of preserving and cooking foods in sealed coverings has been practised throughout history. Food was wrapped in leaves, or stored in fat and salt, before being cooked. It’s also well known that storing food in airtight environments delays the deterioration and drying out of food. Sous vide is a modern-day example of this practice. Pronounced sue-veed, the term means ‘under vacuum’ in French. What are the pros and cons to cooking sous vide? Consistent results – the sous vide method produces evenly cooked steak every time, No more overdone or dry steak. 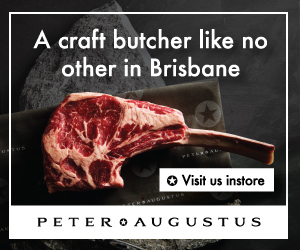 Flavoursome results – the meat cooks gently over a longer period of time, preserving the natural flavours of the cut of steak and guaranteeing a moist and tender eating experience. Convenience – using traditional cooking methods, you are required to monitor your food constantly to check for overcooking and done-ness. Sous vide cooking brings food to a precise temperature and keeps it there. This means you can go about your day, while the sous vide process does its thing, until your perfectly cooked dish is ready to be seared and served. You don’t need a lot of equipment – there are a host of equipment items on the market and many masterful sous vide chefs have expensive equipment at their disposal. However, home chefs need only a few key components to cook sous vide. You can do sous vide using any cooker that can set and hold a temperature for a period of time. 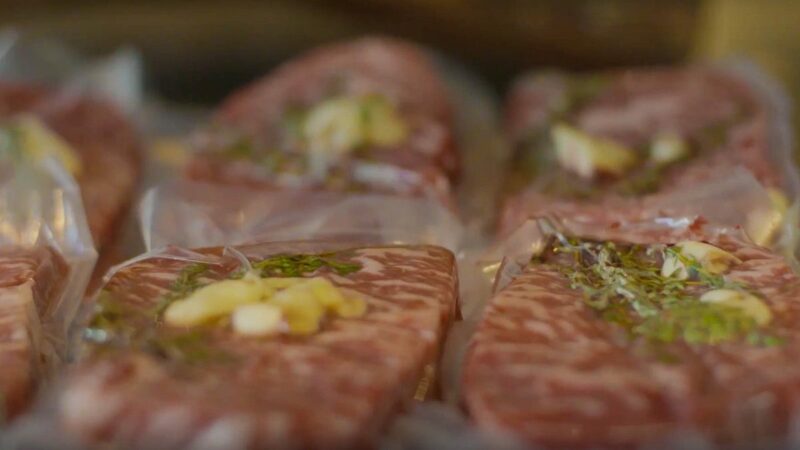 You can still cook sous vide by using a pot, stove, a digital thermometer, and resealable plastic bags. It takes time – sous vide can take longer, from an hour or two for thin cuts of meat to a whole day or days for thicker cuts. It can add a metallic taste – this is from cooking in its own juices and can also negatively impact texture. It’s hands-off – The process may not ‘feel’ like cooking and may take away the experience that we all love – the standing around the barbie, watching, tasting, smelling, and the checking to see if its ready. Food safety issues can include cooking in low-grade plastic, being affected by harmful bacteria from reusing plastic bags and from cooking at low temperatures. Use food-safe plastic bags – freezer ziplock bags do the trick and are perfectly safe. Prepare thin slices of steak so that heating and cooling take less time. Ensure your bags stay submerged during the cooking process. Check water and food temperatures with digital thermometer. Although you can sous vide your food without a sous vide precision cooker, the process we’ll step through here uses one. The time and temperature you cook it to depends on the cut of steak and the level of desired done-ness. You will also need sealable bags in which to cook the steak. If you have a bag sealer, great. But you can also use a high-quality, heavy-duty ziplock bag. Set your cooker to 54°C. 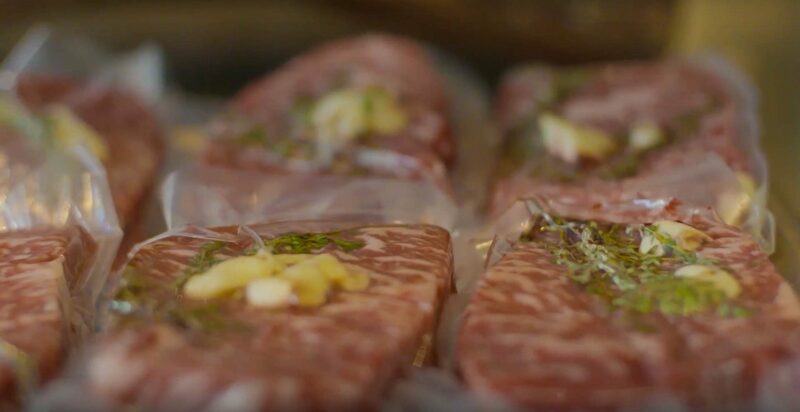 Place the steak into a sealable plastic bag or a heavy-duty ziplock bag. Season your steak with salt and pepper and add herbs if you like. Rosemary or thyme work well. Seal the bag with a vacuum sealer or slowly immerse the ziplock bag into the water, letting the pressure of the water gently press the air out through the top of the bag. When most of the air is out of the bag, carefully seal the ziplock just above the water line. Gently drop the entire bag into the water. For the 200g to 350g steak, set the timer to 2 hours. When done, remove the steak from the bag, place on a plate and pat dry. Heat the oil on a hot skillet pan, add the steak and sear for 30 seconds on each side. This will give the steak that nice golden-brown crust. Let it rest for five minutes and serve.